Hi all, just wondering if anyone can have a stab at dating this, from the typeface used. I’m trying to find out as much as I can about how this was done, but hitting a blank so far. Hi there, thanks for this. I do know how to Google! We have the poster and are just trying to work out if it’s real or not, obviously that’s a tricky call but the text mentioned doesn’t exist, so we are wondering if it’s a theatrical prop, something like that. 1) Of course it’s real - who would go to the trouble of faking a poster of such limited interest? 2) I’m glad you know how to Google, but you didn’t have to go to the trouble of repeating yourself. Steve, trust my *Off Line* comments transmitted, ??? Don`t, lose too much sleep. Mick. Is no one going to make the “dating” joke? Flowers? Chocolates? A dinner and a movie?? Nuthin? its been soooooooo hard not to, go ahead, have at it. That grapefruit is just hangin’ over the plate! Ok, for me and my wife, it was flowers that did the trick. I suggest you try that. might check with Hatch Show Print or The Tribune, only two I know who printed posters. They may have the original cuts. It does not look like a poster Tribune Showprint would have done, typically but now always it would have our name and phone number printed at the bottom if it was us. Paul Ritscher, would probably be your best hope tracking down who printed it an when. I’m with Tho on the cut idea, i suspect the top title area was probably a cut. If you’re trying to date another poster on this site, may I suggest a wrapped and bowtied can of PMS Warm Red? You may be able to check and see if they have any info as to when the story ran as a serial. He thinks it’s 1883, but am often wrong. Letterpress printing between 1880 and 1920 is hard to determine, as so many of the types stayed in use for so many years. He knew the issue was English, as soon as Steve posted, and I would have guessed 1885 - 1895 on the poster, but since they wish exact dates it seems that the best resource is that organization. Thanks so much to Theo Bell, and rmiller. Really appreciate your helpful advice. It’s really a bit of a conundrum, hence my checking here, as it’s my colleagues who run the maryelizabethbraddon association and who own the poster. 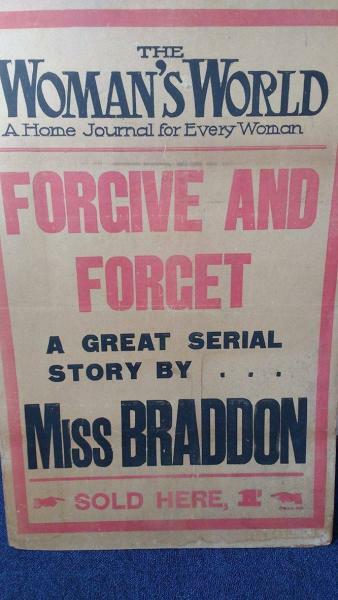 There was never a novel by Braddon of this title, and, having looked through the ledgers of Women’s World, she never published in that periodical. Curious and curiouser! We are trying to work out if a) there is a missing manuscript of a text by Braddon we haven’t come across as yet, b) the poster is a clever fake, stage prop or satirical comment about an existing Braddon text, or something to do with the contemporary scandals involving Oscar Wilde. It’s quite the mystery! I thought approaching it from the printing side of things might shed some light on things, though there are not exactly many clues to go on here. My thoughts were to try and date the font, to think about the style of the poster and what period it fits with, etc. The problem is really that anyone could have mocked up something like this with a hand press. It’s bewildering! Still, I can go back to them now and say no leads as yet. We will go back to trawling through the archives :) it was certainly worth an ask though. As for your comments Mick - great to see you’re letting sleeping dogs lie, as ever. Appreciate your friendly input. K.T. on a personal basis, mailed Steve S. just to explain that some comments do not always come across as intended.?? I have a basic idea of how to google and keyed in Steve,s excellent *Womans World* tip, and came up with some interesting, Time Line and Type faces used in that relative period, have You attempted to trawl that aspect, maybe with Help from the American Wood Type, experts, *Hamilton* for example.! As the Masthead on Your Poster and Steve,s info seem to imply that both are of American origin, maybe trawling the American line of succession MAY help, if you have not already. Plus, is it just possible that with Steve,s comments about Oscar Wilde and His involvement with the Bloomsbury Set, there may be some info to be gleaned from, Hogarth Press Records/Archives. You must have some knowledge of where and if at all.?? Perhaps You have already.!!!. Oscar Wilde, may well have known of, or been involved with The Hogarth Press,!! WHEN they reached the point, where they outgrew their output from the Minerva, Transatlantic Poster Production & Co-operation (unlikely) but way back, who knows, groping in the dark admittedly. My face fits at Charelston Manor, I would (still) ask a few questions on Your behalf, they seem to be interested in the Cropper Minerva (mine) and my efforts .!!! As R. Miller suggests the Masthead is probably Process Plate, but *Hamiltons* U.S. should be able to date the Type with one or two of the *Miss Brandon* very condensed/distinctive letter forms, smacks of Wild west, >Wanted Dead or Alive< posters era. Generally and from a big Volume, I own entitled *Printed Ephemara,* heavily laced with American examples, it seems that way back then, No, imprint was included, here U.K. as long ago as the early 50,s maybe much earlier, an Imprint was ALWAYS included, !!! Have You already, or are you able to examine closely and/or even, identify the Tiny wording under the < lesser than, pointing hand, at right hand side, perhaps even magnifying glass examination on the rear, ??? without defacing, very gentle Brass Rubbing style operation on the rear in Pencil and erased, of course, may produce hidden clue(s) if it is inked in, on the front.!! !